Let’s talk about a difficult but topical subject in today’s society: the opioid epidemic. The misuse and addiction to opioids—such as prescription pain relievers, heroin and synthetic opioids is everywhere. It affects countless victims and families throughout the state of Washington and across the nation. With the increase of opioid abuse, comes the rise of opioid-related auto accidents as a consequence. In 2016, Washington Governor Jay Inslee released an executive order that mandates law enforcement and community partners come up and implement strategies that reduces the supply of illegal opioids. While this is a positive step to address the opioid epidemic, the order doesn’t help to prevent drugged driving in Washington. On a national level, statistics show that drivers killed in crashes are more likely to be on drugs than drunk. According to a 2015 report by the Governors Highway Safety Association and the Foundation for Advancing Alcohol Responsibility, 43 percent of drivers had used legal or illegal drugs in fatal crashes, compared to 37 percent of drunk drivers. Opiates are highly addictive and can stay in the bloodstream for hours after ingestion. In turn, it can negatively affect motor skills and reaction times when behind the wheel of a car. When people hear the word “DUI”, many people often think of driving under the influence of alcohol. However, even prescribed opioid medications, such as Vicodin and Hydrocodone can slow reaction times, increase drowsiness, and impair motor skills when operating a motor vehicle. 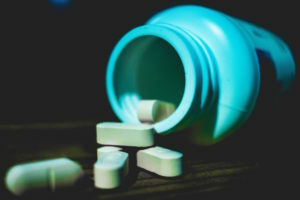 It can be challenging for police and investigators to prove that a driver was under the influence of prescription opiates at the time of an accident. If a blood test is not administered within a few hours, the opiates will likely be out of their system. What’s Being Done to Address the Crisis? State politicians and prosecuting attorneys are working to address the ongoing opioid crisis in Washington. Attorney General Bob Ferguson recently filed a lawsuit against the largest opioid manufacturer Purdue Pharma. It alleges they deceived and mislead doctors that their product was safe for treatment of long-term chronic pain. Prosecutor Mark Lindquist from Pierce County filed a similar lawsuit against Purdue Pharma. The suit alleges they maliciously contributed to the opioid crisis in Washington. Earlier this week, Purdue Pharma announced that it will no longer aggressively market its drugs, such as OxyContin, to doctors and is laying off half its sales force. This is likely the direct response from the hundreds of civil lawsuits, including the ones filed by Ferguson and Lindquist. Walmart, Sam’s Club, and other pharmacies are now giving out free “DisposeRx” chemical packets to anyone who request them. If you have leftover opioids from a medical prescription, the packets will allow you to dissolve and render the pain pills into a harmless substance that can safely be disposed of. The opioid epidemic is a complex and ever-growing public health crisis in Washington and throughout the United States. The devastating consequences not only affects those addicted and their families, it can affect innocent people. This includes motorists and passengers on the road who are the victims of opioid-related accidents. Contact me if you’ve been auto accident and suspect the other driver was under the influence of opiates. My team and I at Evergreen Personal Injury Counsel can help assist you in your quest for justice and to be made whole again.